Blue Carlon Conduit was used in the wiring of my home. I recently noticed that some of the conduit has cracked in spots and has exposed wiring. I would like to repair it without having to splice the wiring if that is avoidable. What would you recommend using to make this repair. Thank you for your time. I don't think that is legal.We don't use that here in Philadelphia for electric but it could be different in other areas of the country. I think this may be in heave use in the Chicago area. 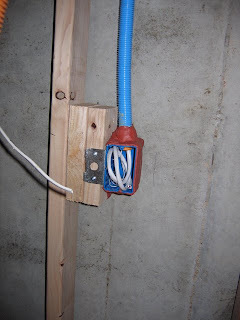 You can use Blue Carlon Conduit to cover MN type wire but not to run THHN. It is mainly use for low voltage lines like Phone and Data here. If it is just a covering you can fix it any way you like. It is just foe appearances.I think you may want to call in a local electrician. Some thing about your set up sounds funny to me.